The Forest is based on a real location in Japan where residents and visitors go with suicidal thoughts and end their lives. This forest is called Aokigahara and lies at Mount Fuji's base. Natalie Dormer (known mostly for her role as Margaery Tyrell on Game of Thrones) plays identical twin sisters Sara Price and the lost sister, Jess. Kind of confusing but it's something we've seen before. Sara is worried about her sister, who is teaching English in Japan and when she hears news of her getting lost in a forest, Sara travels to Japan to find her. The Forest is filled with many deaths and residents know that if you are in there for more than two days, you've got to assume that person has committed suicide. Sara feels like she is linked to her sister and believes she is still alive so she goes in hoping to bring her back home. Accompanied by two others in her search, the spirits roaming around them play with their heads and things get dangerous towards the end of the day. Before nightfall, the guide tells Sara it is better to go back to the hotel and try again tomorrow because during the night things get really scary, especially if you don't have your mind right. She refuses and decides to stay. At that point, The Forest turns into a typical horror flick and Sara risks losing her mind and even death. The rest of the movie is all about Sara's survival and finding her sister Jess at all costs. Sara battles the supernatural while also battling her own mind. The end has a certain twist that I kind of saw coming but wasn't totally sure about. 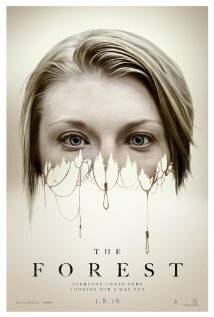 The Forest isn't a bad movie at any rate. I got scared a couple times, so if you feel like watching a scary flick out of season, then give this one a go.